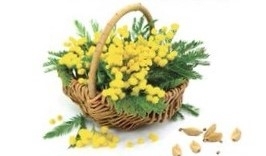 Lampe Berger's Luminous Mimosa embodies the sparkling sensuality of mimosa and the luster of cardamon. It is an opulent floral fragrance with a velvety and sunny heart. Top notes are of citrus, cardamon and aquatic scents combined with heart notes of mimosa, and orange blossom. The bottom notes are gardenia, tonka bean and musks.